“Jeez you got a big reboot. Jeez you got a big reboot,” Fox said of its Predator franchise, prompting the question of why they said “reboot” twice. See, it’s because of the echo: The studio is making its second attempt to relaunch its Predator franchise in four years, following up 2010’s Robert Rodriguez-produced Predators with a new reboot that’s being written by Shane Black—who, long before he became a big, successful comic-book movie director on Iron Man 3, was seen reading them and cracking dirty jokes as Predator’s doomed comic relief, Hawkins. 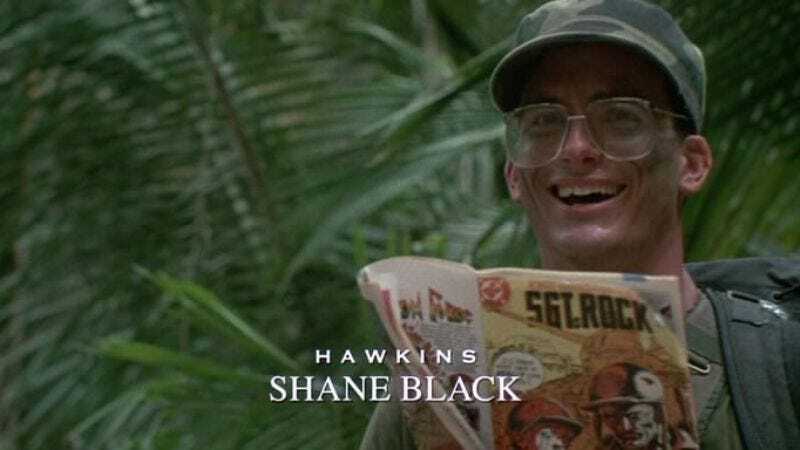 Black is now reteaming with his Monster Squad collaborator Fred Dekker, reuniting the Black and Dekker partnership to [insert power tool wordplay] on a treatment for a new Predator film that will be produced by the original’s John Davis. Anyway, it may seem an unlikely twist of fate that Black—who was cast in 1987 movie primarily to watch over inexperienced director John McTiernan—would now be returning to its world, this time to direct himself. But see, it’s because of the echo.